Home Entertaiment Why Jawad Ahmad barred from speaking at Faisalabad conference! Why Jawad Ahmad barred from speaking at Faisalabad conference! FAISALABAD: Singer Jawad Ahmad who was barred from speaking at a conference in Faisalabad after he allegedly spoke against Prime Minister Imran Khan and his government’s policies, took to Twitter on Thursday to clear the air. According to reports, the singer turned politician was removed from the podium by organisers after he started criticising the premier. 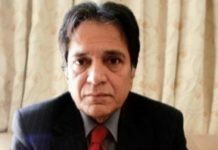 Jawad Ahmad, who is the chief of Barabri Party Pakistan (BPP), has been a critic of established political parties in Pakistan including the prime minister. “Just to clarify to those who don’t know. I was invited in Faisalabad today as Chairman Barabri Party Pakistan by Social Media Conclave to make a political speech and not to speak on social media. That is why I criticised policies of PTI in general and Imran Khan in particular,” Ahmad wrote on Twitter. The BPP chief further said, “I don’t think it was personal at all. It was just a hard historical fact which Imran Khan can never deny. It showed the class character of Imran Khan. A man is known by his actions and the company he keeps. Imran Khan’s politics was built with rich people’s money. “Also, another thing that people really have to know is that PM Imran Khan’s former brother-in-law Zac Goldsmith, that he supported against Sadiq Khan in London Mayor’s election was criticised later for his role in promoting Islamophobia and racism against the immigrant during his campaign,” the 48-year-old added.